A mid-summer holiday Monday. Ahhh. Such a treat. In honour of my day off, I’m taking the day offline too. Paintbrushes and other tools, my two favourite guys, the garden and great outdoors–there’s lots of things I love out there IRL. I haven’t painted in a very long time. I mean, aside from walls, ceilings, furniture. My friends set up a girls night at a painting class. These paint and sips–wine is on offer along with paint–have become very popular in our area. Everyone paints the same painting as the artist talks you through the process. This is the painting we were copying. The artist talked us through the background and then adding the bodies–paint a heart, add arms and very long legs. Add necks and heads and then dress them with swooshes of pink and blue and yellow and red. Accent it with white. And know when to stop before the colours all blend together–that was the most valuable part of the class. The instruction to put down my brush and walk away. I felt a bit like Degas. As the paintings took shape, it was neat to see how they were each slightly different, depending on the colours we chose and our own approaches. I deviated from the plan when it came to the very end. The ladies are dancing on grass, so the curtains in the original painting didn’t make a lot of sense to me. I added some tree branches instead. I can’t say that dancing ladies are my usual style when it comes to art, but I’m thrilled with how this painting turned out. In fact, I think I might give this another try on my own. This painting high on a wall at the artist’s studio makes me think I might be able to do a rendition of my favourite furry fellow. It was fun to be creative in a different way than usual. Are you a painter? I mean, of actual paintings? Have you ever been to an art class? Or a paint and sip? Today I’m diving deeper into the guest room makeover to share the details behind some of the pretty pictures you saw last week. Pretty much every project we do here at the farm is a budget challenge. But this guest room is budget to the extreme. Hand-me-down, redo, thrift and even scavenge were the name of the game. The only things I bought new were picture frames, window treatments, a blanket and towels. Even the paint was reused from the mudroom. Designers talk about jumping off points. For me the jumping off point in this room was the fake wood paneling on the walls–not the most favoured design feature. It may not be shiplap, but it was definitely country, so I decided to play up the farm factor with pine, white paint, rustic elements and pretty robin’s egg blue paint. 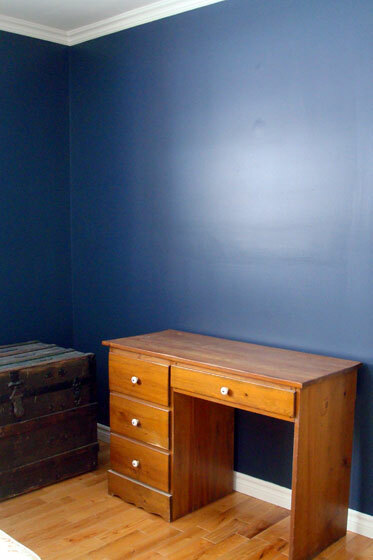 The colour is Wythe Blue from Benjamin Moore. Because the walls are paneling and not drywall, there are little trim pieces in each of the corners and against the ceiling. I decided to play these up–like in my inspiration image–with white paint (Cloud White also from BM–our standard trim colour at the farm). Precision taping paid off with really, really crisp lines, and the white corners add some neat interest to the room. Matt helped me scrape the ceiling, and now it’s beautifully smooth to showcase the thrifted chandelier I found. I think this had been painted black at some point in its past life. The only change I made was to remove the glass shades and shorten the chain (our most frequent guest, Matt’s brother, is 6’4″). The pine comes courtesy of the armoire and desk from Matt’s childhood bedroom. I’d like to style the top of the cabinet somehow someday. Maybe a small collection of books and magazines for guests? The trunk in the corner is my scavenged find. My parent’s neighbours put this out for garbage. My Dad and I carried it home–approximately 20 years ago. This trunk is an example of choose what you love and you’ll make it work. At first, the trunk played a nightstand role in my teenage bedroom. Then it was a very handy side table in the living room at Matt’s and my first house. Now it’s returned to its nightstand function in the guest room. The clock, lamp, water bottle and drinking glasses are all thrifted from Value Village. Above the trunk is my favourite feature in the guest room, vintage family and country photos. The top photo came from the city archives collection. It’s the blacksmith shop that is still standing in the little town that’s closest to the farm. Below that is a photo from my family archives. It’s my great grandfather on a sleigh loaded with huge logs. The neat story shown in the photo is that the sleigh is so heavy it has actually broken through the ice that my grandfather and the horses are crossing. On the other side of the window, the top photo is the general store where Matt worked as a teenager. However, it’s another archive shot with a horse and buggy outside the store–not the common conveyance when he worked there. Below that is a photo from Matt’s family archives. His great-grandfather with a team of horses and a wagon loaded with hay. You know I’m all about personalizing my spaces, and these old pictures are a really meaningful way to do that. The rustic frames that look almost like barn wood are a score from Ikea. I brightened the mats with a coat of Cloud White paint. This side of the room has two more hand-me-downs from Matt’s childhood bedroom: the painted dresser and the pine desk. The painted glass vase and the hydrangea are from my MIL and work perfectly in this spot. The dresser is super cute. Each drawer is decorated with an illustration of a nursery rhyme scene. (The wicker waste basket was another thrifted find). Our welcoming crew of Bax and Ralph are on duty on the desk along with a thrifted organizer (that I repainted) that holds pens and notepads. My distressed chair was a freebie courtesy of past owners. Its red stain was splotched with mauve and mint green paint. Adding a coat of white paint was a big improvement, and I think the distressed look works here. The log cabin pattern pillow is a made-by-me from way back when I was a teenager. I was surprised how well the pink and blue tones in the pillow cover work with the quilt I chose for the bed. I bought the quilt when we first moved into the farm. It was about the only thing I did to establish a comfortable guest room back then. Fortunately, it works well with the blue-green paint, so I’m keeping it. The curtains and curtain rods are new–although the curtains are a DIY, so I’m not sure they entirely qualify. The rods are my go-to Hugads from Ikea. The curtains are my go-to dropcloths from Home Depot (see my tips for making dropcloth curtains). Maybe because it’s my second time around, these curtains weren’t as tedious as the last set I made. Still not my favourite thing to sew, but not quite as painful as before. This final corner beside the desk was the one spot I wasn’t sure about. My original vision was to hang a vintage painting by Matt’s grandpa and below to have a weathered little ladder where I could drape extra blankets. However, this corner was the best place for a mirror, and I felt that the mirror would be more appreciated by guests than the painting. Plus, when I saw this unusual mirror in the thrift store on Friday night and spent all weekend thinking about it and when it was still there on Monday afternoon, I knew it was meant to be. A coat of white paint freshened it up, and I still have a place for extra blankets and towels in a large thrifted wicker basket set on the floor (the towels are the other new purchase in the room). There’s one thing that’s missing from the room, and that’s the bedframe. I have a great metal headboard and footboard from my bedroom at our old family cottage. Matt and I repainted it before we moved into our first house. However, the paint has since chipped, and it really needs to be stripped. The bedframe has been living in the barn since we swapped rooms in our master bedroom switcheroo last spring. If the weather ever warms up, I’m planning to bring it outside and remove the old paint. Once it’s stripped (and potentially repainted), I’ll set it up in the guest room. Even without the bedframe, I think we have a beautiful room that’s welcoming for guests. It was really fun to pull all of the details together for this space, and I feel like we ended up with a room that’s perfect for our farm setting, our family and our guests. This was the first item on my home goals 2016 list, and I’m crossing it off. How do you save money when you’re decorating? Who else is reusing childhood furniture? Do you have a vintage family photo collection? What have you picked out of the garbage and reused? The day is finally here. You’ve seen sneak peaks already, but today you see the whole thing–the brand new guest room. Let’s start with the before. Going way back into the archives, here’s what the room looked like on day 1 when the farm became ours. A herd of dust bunnies all over the floor and dirty valances on the windows. Look closer at the windows and you’ll see the extent of the decorating in this space–sparkly butterfly stickers. Unfortunately, no more my style than the curtains. We cleaned up the dust bunnies, removed the valances, kept the stickers and called this our master bedroom for our first three years. When we moved our master bedroom across the hall, this became a guest bedroom. But it wasn’t the most welcoming space. I found this photo for my inspiration. Ready to see where we ended up? What do you think? Want to come for a visit? I confess, I’m in love with the way this turned out. 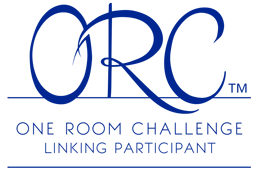 Next week I’ll share the details of what’s in the room. Hint, the sparkly stickers didn’t make it. I’m excited to share that I’m now a regular contributor to ThatMutt.com. 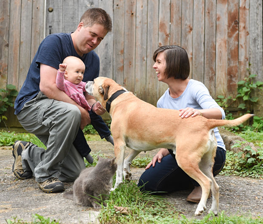 This gives me an outlet to write about dog training, care and of course my favourite dude, Baxter. You can read all of my posts at ThatMutt here. My latest post went up on earlier this week. A slight variation is below. Uh-huh? What about no thumbs, no vertical reach and a tendency to spend most of your time asleep, dude? With Baxter’s help (or perhaps despite it), the guest room is now done. The reveal is coming up next. I was face-to-face (face-to-seat?) with the chair. I had spent days painting it, working my brush around every spindle again and again. The old brown stain had been replaced with a warm white finish. But I was about to change all that. Or I would if I could bring myself to step towards the chair. I had a piece of sandpaper in my hand, and my plan was to rub it over my freshly painted chair making it look older and a little bit worn. My vision for the guest room is to embrace a bit more rustic style. A slightly shabby chair would fit in better than a perfectly painted one. I lifted the sandpaper and got to work. The end result looks okay, I think. Definitely more interesting than the plain white chair. I’ve never been a shabby chic person, so I’m still adjusting to this look. Now that the guest room is coming together, though, I feel like the chair fits in. The plan for the weekend is to focus on the curtains, which are pretty much the last to-do for the guest room aside from some more accessorizing. I should be sharing the finished space with you soon. Have you ever distressed furniture? Did it make you nervous? Are you a fan of the shabby chic style? What causes you anxiety when you’re making over furniture? I’m pleased to welcome Sarah in Illinois back to the blog. 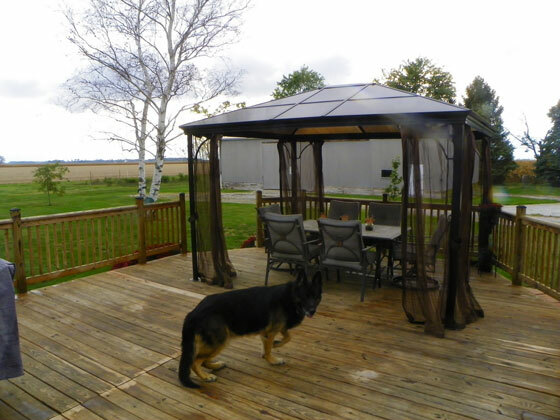 Today’s post is full of the things I love: a big doggie, country views and a great DIY transformation. Take it away, Sarah. We had done a little research on how to protect it. One thing that we had read was to wait a year to put any sealant on it. We chose to wait even longer. The boards we used were very green. That is, they had a lot of moisture in them. This was obvious when we installed it, but it also showed up over time as the boards warped more than we had liked as they dried. This year I decided that it was time to get at least one coat of sealant on it. 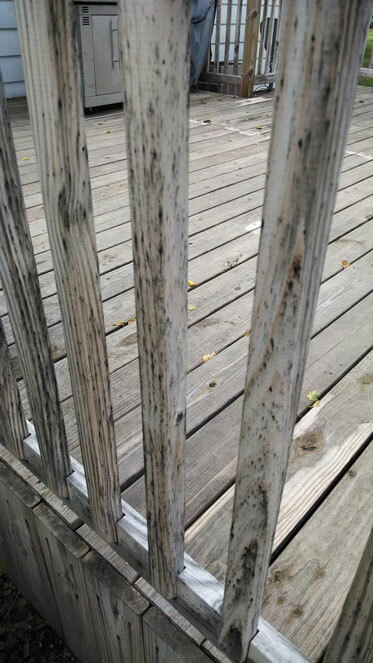 The thing was, after two years, the deck was very dirty and stained. I believe this was a combination of normal use, stains from the grill, mold from moisture and just pollution in the air. So I chose to clean it first. It took just a little bit of prep work. I have two unbelievable huge and beautiful mums, so I made sure to drape plastic drop cloths over them to keep the cleaner off of them. 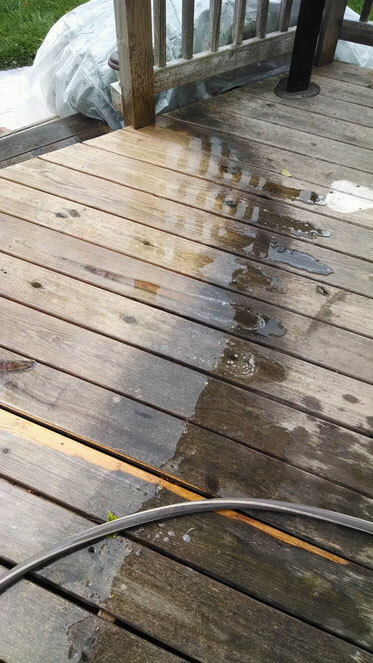 The deck wash I purchased was a bleach base and it worked like a charm for cleaning the deck. I bought what I believed to be enough based on the square footage that it said it covered. This was way off. I ended up needing double the amount. I think that part of the reason was that maybe the square footage listed did not take in account the railings. But I am sure it also had to do with how heavy I sprayed it on the wood. I used a hand held pump sprayer to apply the cleaner, then I used a broom to lightly scrub trouble spots, and finally I sprayed it off with a garden hose. This was easily a one person job and if I had had enough cleaner would have taken just one afternoon. Then I let the deck dry for a couple weeks. I wanted to make sure not to trap any moisture in with the sealant. When it was time to seal the deck, it took more prep work and took two people. Steve and I used the same hand pump sprayer to apply the sealant. We found the method that worked for us was for Steve to spray the railings, then the floor and for me to follow up with a brush and smooth any drips and puddles. We wanted to make sure we put a heavy coat on, but we wanted it to be fairly even. The sealant was much messier than the cleaner. It got everywhere–on us, on the siding, and even oversprayed to my nearby herb garden. We are planning to reside the house in the next year when our addition is finished, so I was not too upset by the overspray on the siding, but I sure wish I had harvested my basil and oregano before we got started. We feel the deck needs at least one more coat of sealant for us to be happy with it. But since harvest has started, it looks like it is going to be next spring before that gets done. In the meantime, I am so happy to have the first layer of protection on it. The cooler weather is just begging us to come out of the house and relax! 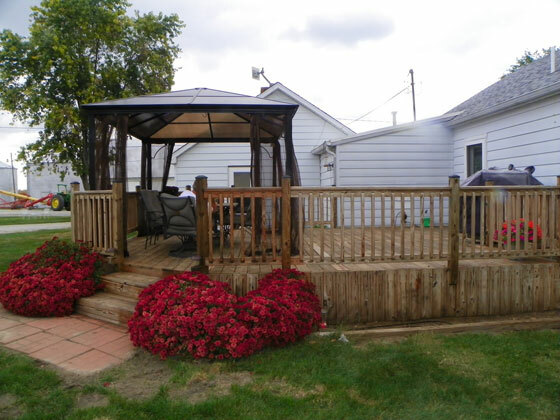 What a great outdoor space, Sarah. Those mums are amazing. 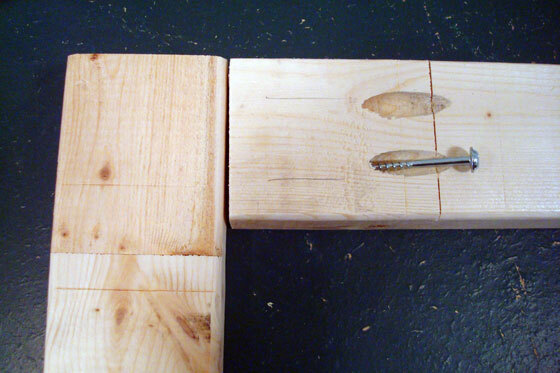 I’m always so impressed by how wood can be restored with a good cleaning and a bit of work. Good job. I hope you get to relax outside and enjoy it. Anyone else have tips to share about restoring wood? 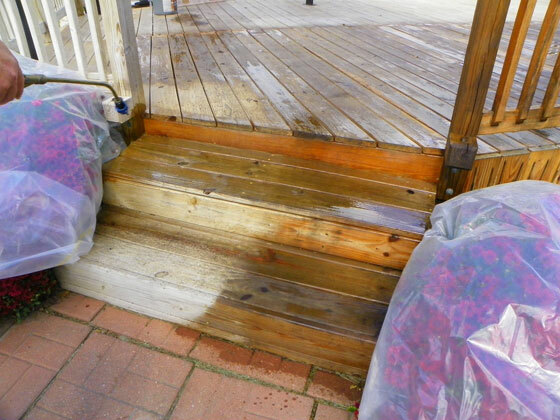 Have you ever stained a deck? Who else has had a project that’s taken a bit longer to complete than planned? I absolutely did not know what colour I wanted to paint the master bedroom. Something light and soothing? Maybe a shade of green or grey? Was this my moment to finally just go with white? If you take a look at my master bedroom Pinterest board, you’ll see I was all over the map. When I finally settled on navy blue, it was a snap decision. There was no sampling, no questioning, not even a paint chip. I walked into the hardware store and asked for a can of Hale Navy. I’d seen it on a couple of other blogs. I liked all of the rooms I’d seen it in. Might as well give it a try. But when I opened the can, I wasn’t sure. It looked so grey! I thought I’d chosen blue! 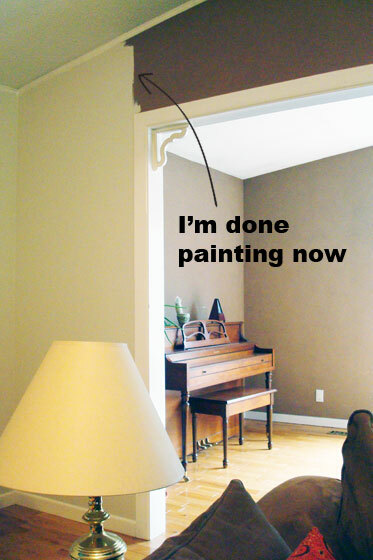 Now that the room is painted, I couldn’t be happier with the colour, and I’ve learned an important lesson. Whatever colour you’re thinking of, go a little bit grey. This insight isn’t anything new. Young House Love did a great post a couple of years ago showing how the colour you envision might not turn out the way you think it will once it’s on your walls. However, experiencing it myself in front of my own eyes was different than reading about it on my computer screen. I’m going to share my lesson on your computer screen nonetheless. 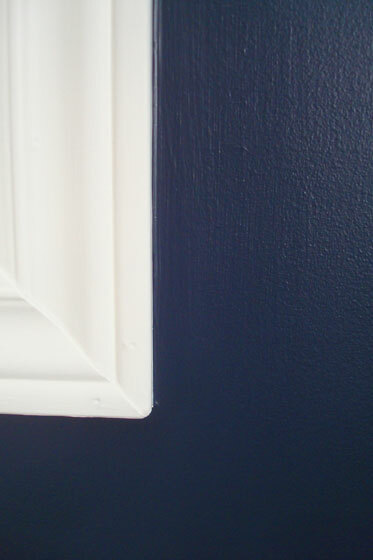 Here’s the Hale Navy chip from Benjamin Moore’s website. Very grey to my eye. 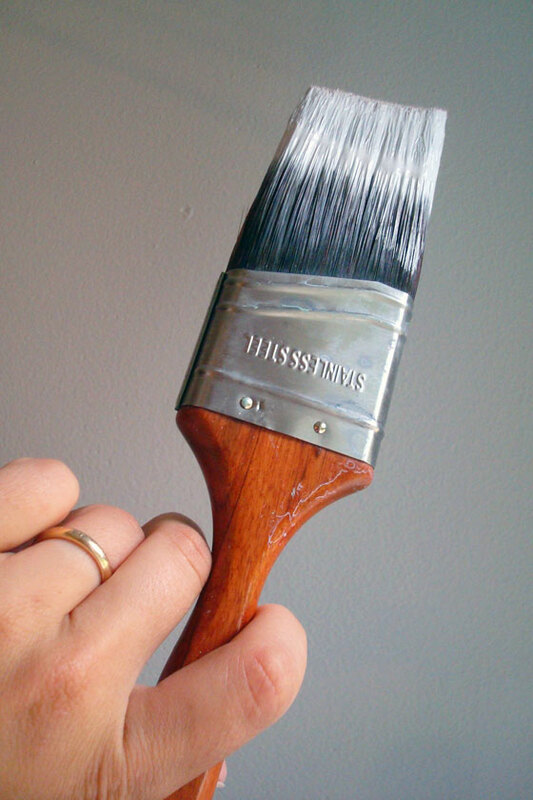 Here’s the paint on my brush. Still very grey in my opinion. And here’s the paint on the wall. Thanks to natural light and the vagaries of photography, this looks very blue. (Ignore the random furniture. We haven’t set up the room yet, so we’ve just stuffed some of the guest room furniture back in the room. Although I do love how the wood desk pops against the blue). Here’s the paint up against the bright white trim. This is a bit truer to how Hale Navy looks IRL. Do you have any projects on the go right now? How are you doing on your 2015 to-do list? 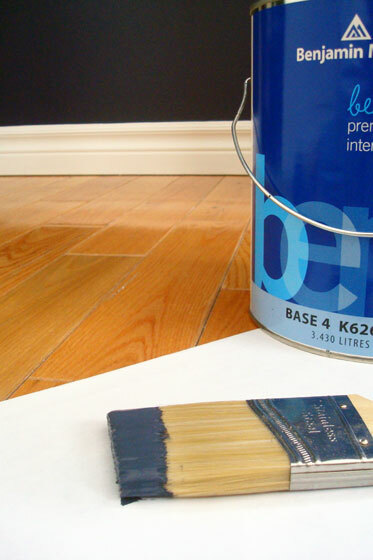 Do you have any tried and true strategies for picking paint colours? Take a journey with me back to February, would you? Don’t worry. You don’t have to actually go back to the time of snow and cold and dark. Just remember back in February when we painted the foyer, kitchen and hallway. Now let’s go back a little bit further to January when I posted my 2014 Home Goals, and I said I wasn’t going to paint the living room this year. Well, I lied… kind of. 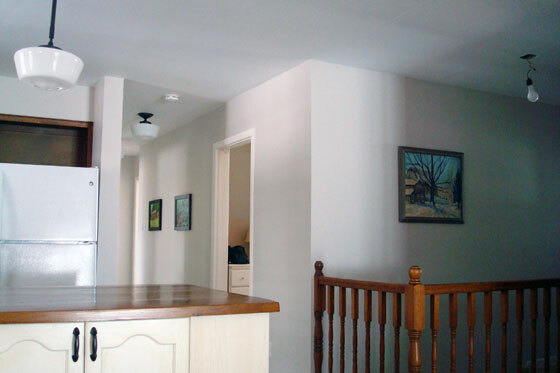 The kitchen, hall, foyer and living room all run together, so I planned to paint them all the same colour. Knowing that I wanted to set up my bookshelves this year, back in February Matt and I painted one wall of the living room–the wall I planned to put the bookshelves on. I figured once my shelves were set up and full of books, I wouldn’t want to take everything down again to paint behind them. So the living room has looked a little bit like this for the past six months. Stylish, I know. Well, the thing is, when I started the bookshelf makeover this month, I realized that if I put the shelves where I originally planned, we wouldn’t have room to walk around the couch and into the dining room. I decided to put them on the opposite wall. A wall which was unpainted. Whoopsie-doodle. So my August project report goes something like this. Put the bookshelves that had gotten damaged in the move back together. Took the big fat bookshelf apart, cut it in half and rebuilt two new sets of shelves. Added iron-on edging to the new shelves where I needed to. Stripped the paint off the TV stand. Raised the TV stand by half an inch and added trim around the bottom. Realized I was going to have to paint the living room. 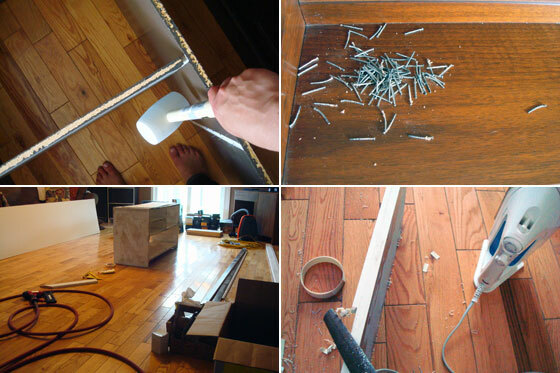 Here’s some evidence that I did actually do some work on the bookshelves. Despite my progress, the bookshelves are kind of on hold right now. They’re all set up in the guest room ready to be painted. However, I’ve shifted my attention to the living room. Pull out nails where pictures were hung. Sand the incredibly rough walls. The living room is both simple and complicated to paint. Complicated because it’s a vaulted ceiling that requires a big ladder to reach the top of the wall. Simple because on the two walls I’m painting, there is an archway on one and a patio door on the other. The actual wall space is minimal. And yes, you read that correctly. I am painting only two walls. Of the four walls in the living room one is already painted (as you saw) and the other contains the fireplace. I am not painting around the fireplace until we’re done whatever we do with the fireplace. So my August project is another bit of a fail. 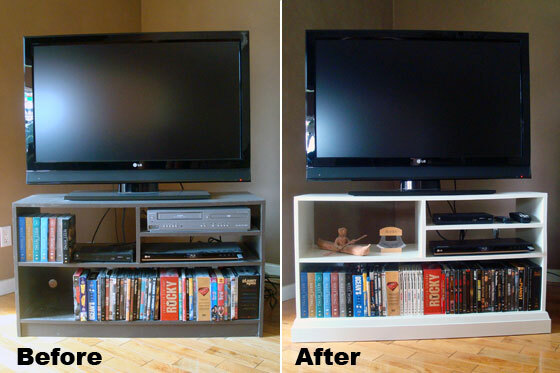 I did manage to get the TV stand completely finished though. I’ve put it in place, even though we’ll likely have to move it when we paint. I had to finish something this month. What did you accomplish this month? Have you ever gotten mid-way through a project and only to find your to-do list has grown? It’s St. Patrick’s Day, so today’s post is all about something green. 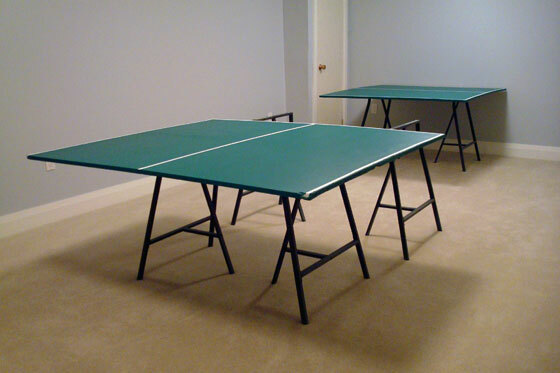 Our new(ish) ping pong table. This ping pong table was a bit of an experiment. We found the top (in two pieces) in the barn when we first moved in. It was pretty dirty and had even been pooped on by the swallows that live in the barn. I am always optimistic, so one day last summer, I dragged the two halves outside. I have no idea how I managed to move them by myself because each piece is extremely heavy. I haven’t been able to carry them on my own since. I scrubbed with a brush and sprayed with the hose until all of the poop and dirt (and a fair portion of the original green paint) washed away. Matt did not share my optimism that the table could be rehabilitated. That night he tucked the pieces deep into a corner of the driveshed. I have no idea how, though, because the tabletop is heavy even for him to move on his own. Despite his lack of enthusiasm for the project, Matt did help me carry the top into the house. Then, one weekend while he was out of town, I went to work. 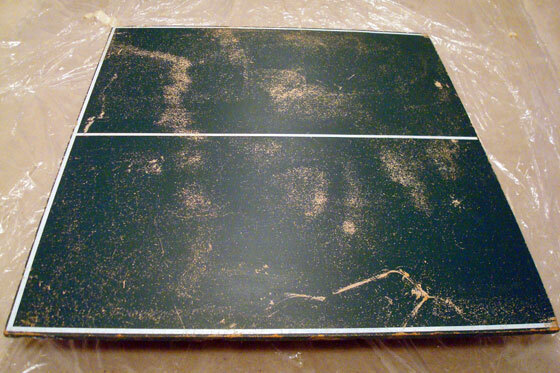 This project was a total experiment, and I’m sure ping pong purists out there will be horrified. But (spoiler alert) everything worked out, so I’m sharing my technique with you. There were two big issues with the table: 1) We had no legs to go with the top. 2) The top itself was not in great shape. The leg issue was easy to solve with six trestle style legs from Ikea (Lerberg). The top took a little more effort. I started with a coat of fresh white paint over the lines. After sleeping on it for the night, I realized I really should have sanded the top first, so the next morning I basically started all over again. I sanded down the top, which was not an indoor task. 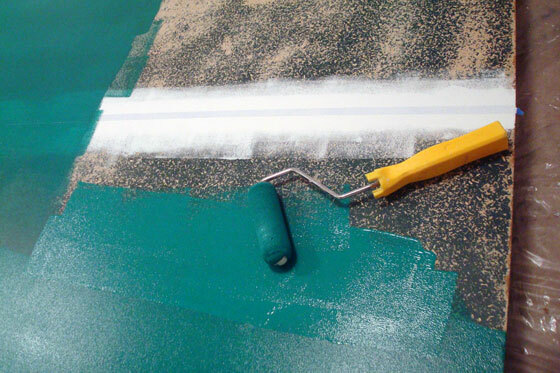 Sanding resulted in a fine green powder over the whole room–not the best scenario with our nice light carpet. 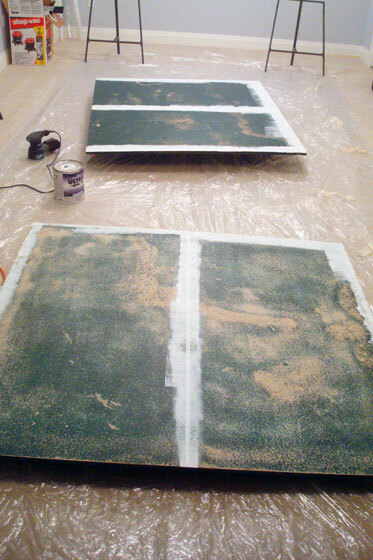 There was a defined line between where the drop cloth had protected the carpet and where the green dust had floated beyond the drop cloth’s reach. I was very glad Matt was not home to see the mess I had made. The Shop Vac erased the green mist, and I was able to get back to the painting. White paint went on again, and, then once it was dry, I taped off the lines. 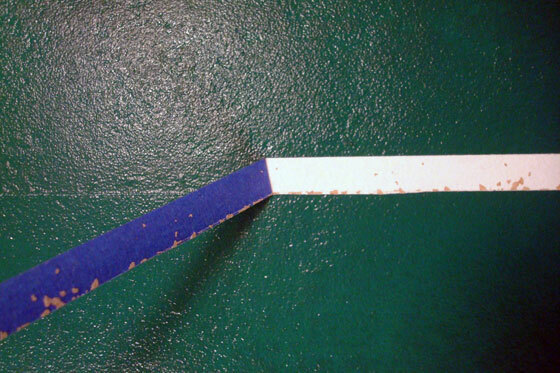 Since painter’s tape doesn’t come in ping pong line widths, I had to very carefully trim it. Then the tape got a quick coat of white paint to seal it, and after some drying time I moved onto the green. Since I wasn’t sure if this was actually going to work, I used some regular latex paint that we had left over from Matt’s office. It’s Manor Green from Benjamin Moore in case anyone’s interested. The green took about three coats, I think. 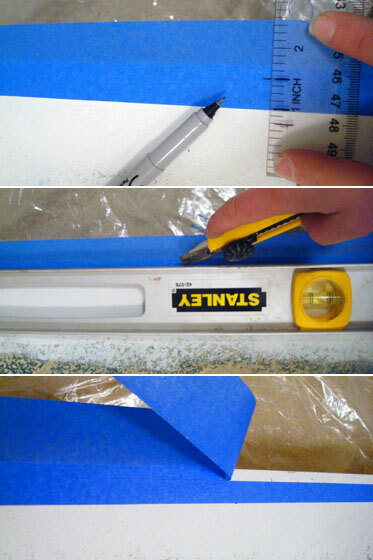 On the final coat, I carefully peeled off the tape to reveal the white lines. Some of the white flaked off (I think giving the white more time to dry, or even doing two coats would have been helpful). Chips aside, the finish was a massive improvement over the table’s previous state. In fact, Matt was so impressed when he arrived home that he started to think that maybe I wasn’t entirely crazy in wanting to save the table. So now I had a tabletop and I had table legs. How to put them together? 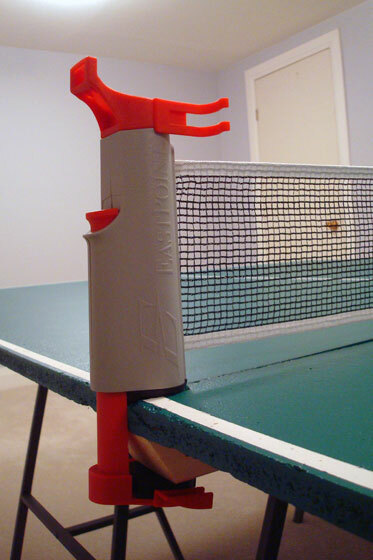 It turned out that the Lerberg legs are a bit shorter than regulation ping pong height of 30 inches–hey, I have some standards. Using a few 2x3s and my Kreg Jig I built a frame to attach to the underside of the tabletop. I screwed the frame to the tabletop… or at least to one half. The top ended up being too unwieldy and heavy as one big piece, so I didn’t screw everything together. We set the top on the frame and the frame on the legs, and we think each piece is heavy enough to stay in place on its own. 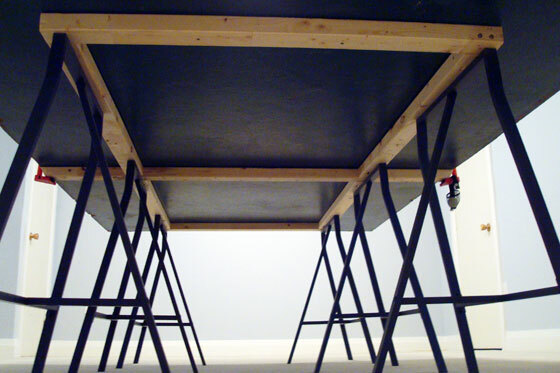 The six Lerberg trestles mean the table is very leggy. However, we really needed the support in the middle of the table as well as at each end. We got a very simple cheap net at Walmart. 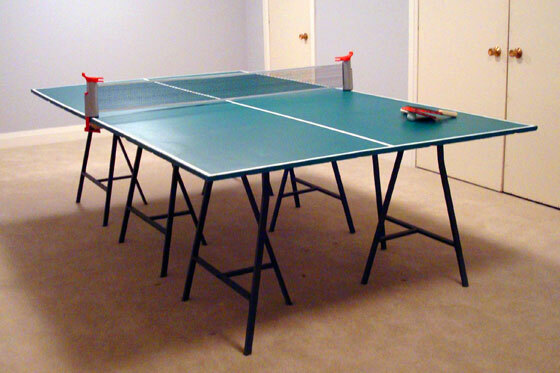 It’s called an “everywhere table tennis” from EastPoint, and we just clipped it onto the table. Again, I wasn’t sure that this refurbishment was actually going to work, so I didn’t feel the need to invest in a professional net. With the table set up, Matt broke out the paddles, tapped one of the balls across the net, and it bounced. It worked! We had a functional ping pong table. I had no ping pong skills, but after a week of daily practice, I’ve improved a lot. I finally won a game against Matt yesterday (he also may have let me win one). 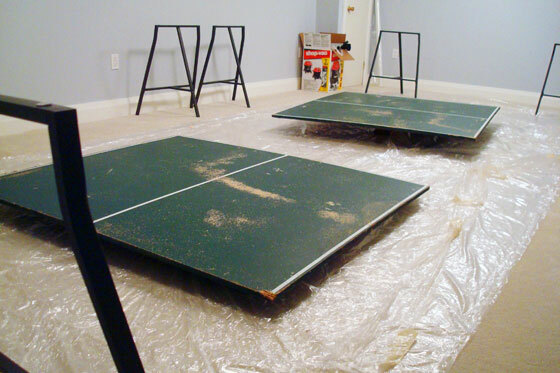 My ping pong prowess aside, refurbishing the table was a definite win. Have you ever rehabbed a piece of furniture that seemed beyond hope? Anyone have any ping pong pointers? How are you celebrating St. Patrick’s Day? Enter your email address to follow Home on 129 Acres and receive notifications of new posts by email.